Dive into three awesome weeks of getting trained up to make an impact. Join God's plan to bring life to a dying world. What are you doing this summer? It’s been an honor to bi-annually host the Collegiate Church Planting Collaborative. This year we have the privilege of hosting over 120 collegiate leaders from across the nation. Is the college campus the most strategic mission field in the world? Brian Frye facilitates a discussion between Steve Lutz, head pastor of Calvary Baptist Church – Penn State, and our senior pastor, Ed Kang. During the three days of Collaborative, invitees move in and out of large group and small group (Cohort) sessions, participate in breakouts, engage in plenary sessions and share family meals. Every participant has the opportunity to hear from field experts as well as to contribute their knowledge and experience to the collective learning of the Collaborative. 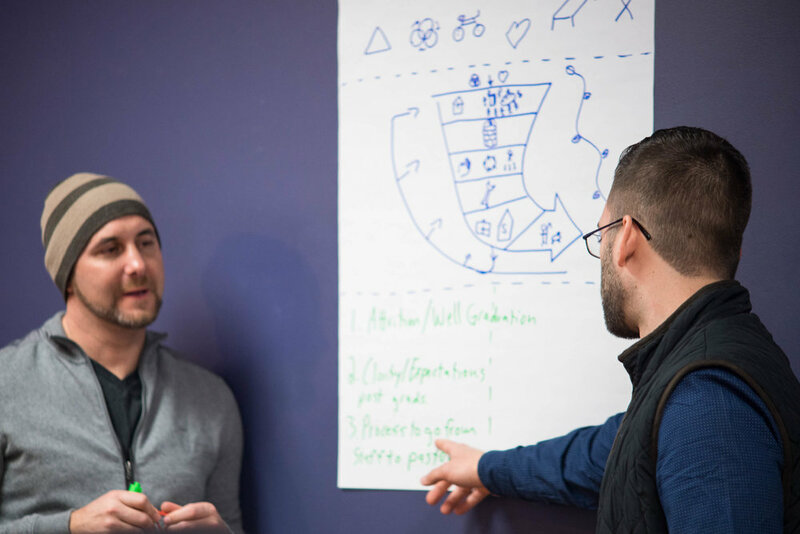 By Collaborative’s end, all attendees will walk away with 1) a deeper understanding of their own system, 2) a broader view of effective ministry in university settings and 3) an actionable, team-generated plan with next steps to accelerate planting through their church. Come join us for a special worship service as we approach the Christmas holiday! Check out our Gracepoint Berkeley Vimeo Video Site for clips and videos from our special events! There are hours and hours of funny & thoughtful & humerous & memory-making video clips - check it out! Check out Gracepoint Berkeley Devotions Resources! These are precious resources for quiet time material for personal devotions or for personal study in Scripture. Many Gracepointers and many friends from other fellowships and churches have been using these resources. There are DT Groups (Devotion Time Groups) that go on daily or throughout the week. Join a DT group or just come when you can! New Students... Come check us out! - the Welcome Week Activities! Celebrating the biggest event of the Christian calendar with us! We will celebrate how this historical event of Jesus' resurrection from over 2000 years ago Jesus' resurrection still bring restoration, healing and transformation in our lives today. Join us as we celebrate Easter together! Jesus' resurrection continues to bring restoration, healing and transformation in our lives today. The 9am service is mainly for our Praxis group, other ministry groups will be part of the 1:30pm service. Please feel free to join us at a time that works best for you. Join us for Good Friday Service as we commemorate Jesus' death on the Cross and reflect over it's deep implications in our lives. Join us as bid farewell to 2015 and usher in 2016 together. We will hear sharings of God's faithfulness and have times of reflection and prayer as we look forward to all that God will do in 2016. Join us as we celebrate the Baptism of our brothers and sisters and recount God's faithfulness in their lives. Join us as bid farewell to 2014 and welcome 2015. We will hear sharings of God's faithfulness, times of reflection and prayer as we look forward to all that God will do in 2015. Celebrate Easter at Gracepoint with a time a special music, videos and message. Join us as we pause and reflect on God's greatest gift of love to us, Jesus' death on the Cross. Join us as we give praise God and celebrate Thanksgiving together!